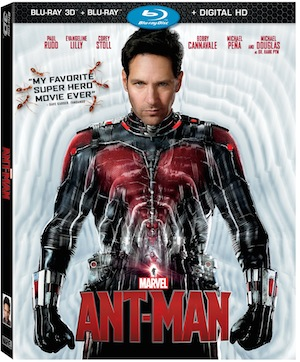 Marvel, the Studio who brought you “The Avengers”, now brings to life one of the original Avengers — Marvel’s Ant-Man. Bring home the epic heist as Ant-man embraces his inner hero and harnesses the unique ability to shrink in scale to save not only the world, but his daughter. Full of both humor and heart, Marvel’s Ant-man is the perfect gift this holiday on Blu-ray and Digital HD. SYNOPSIS: The next evolution of the Marvel Cinematic Universe introduces the newest member of the Avengers: Marvel’s Ant-Man. Armed with the amazing ability to shrink in scale but increase in strength, master thief Scott Lang joins forces with his new mentor Dr. Hank Pym to protect the secret behind his spectacular Ant-Man suit from ruthless villains! With humanity’s fate in the balance, Pym and Lang must plan and pull off a daring heist against insurmountable odds. Filled with humor, awesome special effects and exclusive bonus features, this action-packed adventure takes you to new levels of pulse-pounding excitement! CAST: Paul Rudd (This is 40, Role Models) as Ant-Man/Scott Lang, Evangeline Lilly (The Hobbit: The Battle of the Five Armies, Lost) as Hope van Dyne, Corey Stoll (This Is Where I Leave You, The Bourne Legacy) as Yellowjacket/Darren Cross, Bobby Cannavale (Spy, Chef) Michael Peña (Cesar Chavez, The Martian) Tip “T.I.” Harris (Identity Thief, Entourage), Wood Harris (Justified, The Wire), Judy Greer (Tomorrowland, 13 Going on 30), David Dastmalchian (The Dark Knight, Prisoners), as Paxton, and Michael Douglas (Last Vegas, The Game) as Dr. Hank Pym. Set your watch and count down the action in this fast-paced behind-the-scenes look at how to pull off a heist movie, including Scott Lang’s hilarious heist “family,” Ant-Man’s costume, plus amazing stunts and effects. Shrink down to size in this fascinating look at creating the world from Ant-Man’s perspective, from macro photography through the subatomic. A hard-hitting collection of content, including a glimpse at the future of Pym Technologies with Darren Cross, anchor Christine Everhart’s interview with soon-to-be-released prisoner Scott Lang on his notorious VistaCorp heist, and more. FEATURE RUN TIME: Approximately 117 min. Disney Movies Anywhere (DMA) is an engaging and family-friendly cloud-based digital movie service that makes it simple to buy your favorite Disney, Pixar, Marvel and Star Wars movies once and watch them anywhere. With DMA you can explore Disney’s library of over 450 eligible digital movies, discover hours of new and exclusive short-form content, and watch your digital movies from the comfort of the living room or across multiple mobile devices. Using the free DMA apps and website, you can connect your DMA account with participating providers including iTunes, Amazon Video, VUDU, Microsoft Movies and TV and Google Play and unlock access your eligible movie collections across platforms and devices – iPhone, iPad, iPod Touch, Apple TV/Airplay, Amazon’s Fire tablets, Fire TV and Fire TV Stick, Microsoft Movies and TV service on Windows and Microsoft Xbox devices, Android mobile and tablet devices and Android TV, Chromecast and the Roku® platform. In addition, you can redeem Digital Copy codes found in Disney, Pixar and Marvel Blu-rays and DVDs, as well as earn Disney Movie Rewards points with every digital purchase. Own The Man from U.N.C.L.E. on Blu-ray Combo Pack or DVD on November 17 or Own It Early on Digital HD on October 27!